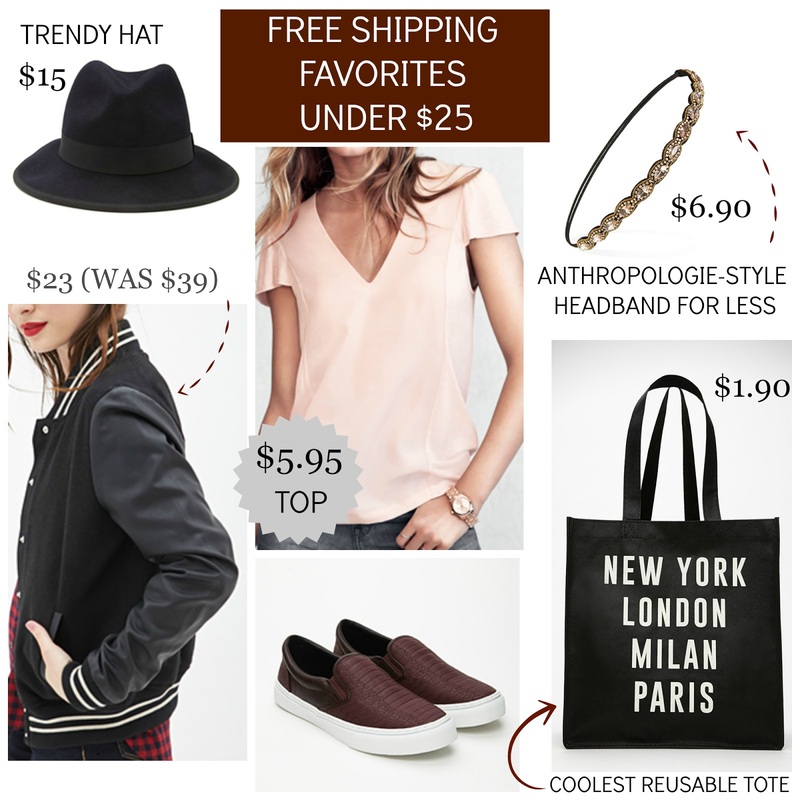 Tracy's Notebook of Style: Forever 21 + H&M Free Shipping Deals! Headband $6.90 This pretty headband is a steal and nearly identical to Anthropologie's in person. Graphic Shopper Tote $1.90 These are their reusable totes, so it's very thin, but also large in size - I'll be ordering a few to package some holiday gifts. Faux Leather Slip-Ons $24.95 I've been obsessed with this style shoe since last spring and this color is so perfect for the season in this faux textured pattern. Butterfly Top $5.95 ($12.95) One of the best parts about free shipping on all orders is finding "daily deals" like this top! Letterman Jacket $23.12 ($39.80) I loved this jacket when I first saw it in September, get it while you can at this price (also in burgundy and navy). Wool Fedora $14.80 Hats are bigger than ever this season and Forever 21 has had the best selection and the best prices without even being on sale (also in tan and black), a good way to try a trend without the high price commitment.